What do environmentalists make of the PN’s green plan? A number of environmentalists were asked about the PN’s green proposals, issued last week. Ivan Martin reports on their reactions. The Nationalist Party’s new environment policy is “thorough and promising”, stakeholders believe, however clear environmental timelines would help the electorate trust it to deliver where successive governments have failed. 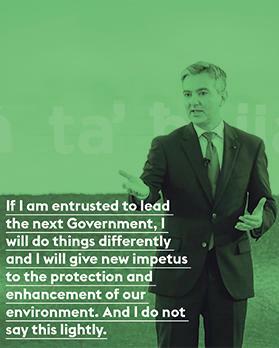 PN leader Simon Busuttil last week launched a list of environmental proposals, hedging his bets on a green agenda, along with good governance, to try and upstage the Labour Party at the next election. The document, ‘A Better Quality of Life’, puts forward 16 key focus areas and 171 green proposals, mapping out a plan as far forward as 2050. Among the ideas to come out of the document are a new skyline policy, the exclusion of land-reclamation for speculative purposes and an increased emphasis on solar rights. Perhaps the most talked about suggestion, a promise to enshrine environmental protection in the Constitution, has been hailed by the experts contacted by this newspaper as a sign of “real action”. Veteran conservationist Alfred Baldacchino said this commitment could finally see parties take a stand against long-time abuse. “The commitment to include the protection of the environment in the Constitution contributes to making hot potatoes easier to handle,” he said. Marlene Farrugia, the former chair of Parliament’s Environment Committee, felt, however, that “quite a few sizzling potatoes were spared a mention!” She did not elaborate. Environmental lobbyist and The Sunday Times of Malta columnist Claire Bonello also praised the constitutional move. She hopes it could mean that the environment will no longer be wiped off the statute books by MPs at the swipe of a pen. But can the PN be trusted to deliver when it comes to the environment? Many remember the position taken by previous Nationalist administrations not so long ago. In 2006, much to the dismay of environmental groups, the PN government revised the development boundaries in all localities. The result? An area roughly the size of Siġġiewi was turned into developable land. During the same period, the government facilitated the construction of penthouses by relaxing the conditions and increasing height limitations in localities such as Swieqi and Marsascala, intensifying development in already built-up areas. Sociologist and former Alternattiva Demokratika leader Michael Briguglio said the PN would have to provide clearer pledges in the run-up to the next election. “The PN document already proposes clear commitments on issues such as major ODZ development [the PN has pledged to renegotiate a controversial deal granting virgin land at Żonqor Point to a private developer]. In other areas, such as water management, the PN can offer clearer commitments,” he said. Dr Bonello shared Dr Briguglio’s sentiment. The PN, she said, had to find a way to convince the electorate that it would “walk the walk when in power”. “How can it do so? The one thing that springs to mind is by declaring set dates for the implantation of certain measures and by demoting whoever had a hand in the country’s sad environmental state to the dark, dank cellar under Stamperija [the party headquarters]. We all know who I’m referring to,” she said. How would you judge the PN’s environment document? Alfred Baldacchino, conservationist: This document is comprehensive. It provides a proper definition of the word ‘environment’, binding the biological and the physical, making it as comprehensive as possible. The commitments allow stakeholders to be involved in decision making, so decisions in the national interest will not be decisions against the environment. Michael Briguglio, former Alternattiva Demokratika (Green Party) leader: It is evident the PN embarked on a wide-ranging consultation exercise coordinated by experts in the field. The result is a text which proposes a better policy framework than that put in place by the current Labour government. Claire Bonello, green lobbyist: The document looks thorough and promising. I especially like the proposal to entrench environmental protection rights in the Constitution. The commitment to revise SPED is commendable. In its current format, it’s a ridiculous non-policy which is as stretchy as knicker elastic. Marlene Farrugia, former chair of Parliament’s Environment Committee: It is an excellent working document which implies that the PN have learnt from their mistakes and the mistakes of the PL. Simon Busuttil is leading his damaged party into cleaner, favourable territory where the environment is concerned. Can the PN be trusted to deliver on its green agenda? AB: I cannot imagine any political party riding roughshod over the environment anymore. MB: The commitments the PN is making are clearer than those coming from the current administration, but some could still be made clearer. It should provide clearer pledges in the run-up to the election. CB: It has to convince the electorate it will walk the walk. It should set dates for the implementation of certain measures. MF: I do not know what a future PN government will be made of, therefore I cannot gauge whether it will keep its promises on the environment or not. If the same people who brought about the 2006 expansion in building zones make up a future PN government, then I most certainly do not trust it, in spite of Simon Busuttil’s honest intentions. If, on the other hand, there is a coalition government made up of a significant number of tried-and-tested environmentalists, then yes, what is left of our environment will be safe. You are currently browsing the archives for the Marlene Farrugia category.